Anti-Stress Treatment - hot towels, dry brushing, aromatherapy massage & body wrap. Clay wrap (2 hours)﻿ - hot towels, clay massage & body wrap﻿. Hot Stones - full body massage with hot stones, placing hot stones, and aromatherapy. Spa Therapy - add $10/hour to massage prices. Spa Treatments are 75 - 120 min. Foot Treatments for the soul! 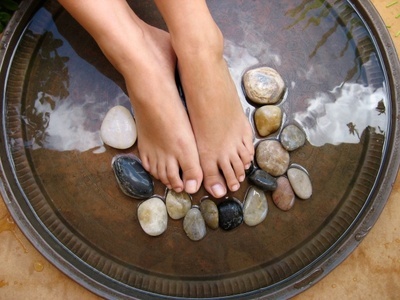 Foot treatments: vibrating foot bath / hot towels, aroma foot scrub & pumice, followed by aroma massage. Totally delicious! as your own little slice of heaven. If you need to change or cancel an appointment, please give us at least 24 hours' notice to avoid charges. All rights reserved. No portion of this site may be reproduced without prior written consent.